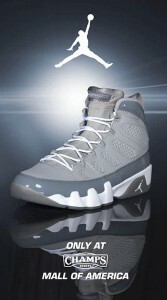 Today Champs announced they will restock the Cool Gray 9 on 5/30. Rumors about the May restocks always had the Retro 9 listed for release, but on 5/25 when it didn’t show, we thought it must have just been hype. This is the 8th restock for Champs 10 Days Of Restocks event and only available at their Mall Of America store.